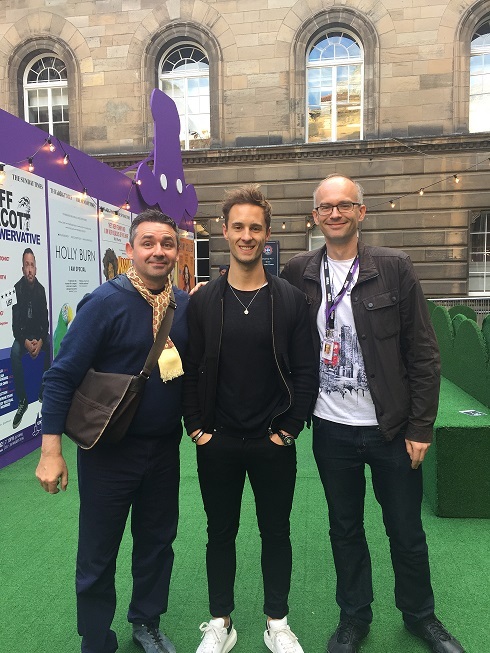 Former Masters champion Alan McManus joins actor Samuel Curry and David Hendon at the Edinburgh Fringe for a performance of The D List. Eurosport snooker commentator David Hendon has worked in the sport for many years, but during his spare time away from the box he has become an acclaimed playwright. David, having worked in snooker for so long, what is it that inspired you to take up playwriting? “Everyone needs a hobby and being a journalist I really enjoy writing. I had written a few scripts years ago when I lived in Birmingham, but I didn’t take it too seriously. I then went to the Edinburgh Fringe to watch some plays and thought to myself that actually a lot of them weren’t that good. However, it is fine to think you can do better, but really you need to give it a try. Your play Banana Crabtree Simon had a successful run in March and is returning at the Catalyst Festival in Battersea next month. It is quite an emotional performance, tell us a bit about it. “Writing a monologue, which is what Banana Crabtree Simon is, was really interesting because it is one person telling the story, but he also has a world around him. The character has dementia and I was interested in tackling that topic, because it impacts on so many families. You often see sitcoms and comedies where older people are made fun of because they have dementia, but it isn’t funny when it is in your family. The play was an attempt to tell the story of one person suffering from it, but you also hear about his family relationships and how it can impact other people. Former Egghead CJ de Mooi performed in the original production. What was he like to work with? Two years ago a snooker based play called The Nap was on at the rather appropriate venue of the Crucible Theatre in Sheffield. It is now set for a run in New York. How did you find it and have you ever considered writing a play about snooker? “I came at the play from from two different angles: snooker and theatre. I thought it succeeded on both levels. It wasn’t disrespectful to snooker, far from it. The whole point was that it was at the Crucible. It was funny and had a proper story. I thought that John Astley, who was the professional player involved, was brilliant. There was a lot of pressure on him to perform and he did. “I’m interested that it is going to New York. It is a very British play. It will be intriguing to see how it does over there. There are a lot of references which are uniquely British, so we will see how they adapt. You can see Banana Crabtree Simon at Theatre503 in Battersea on Thursday 12th July and Saturday 14th July at 8:30pm.